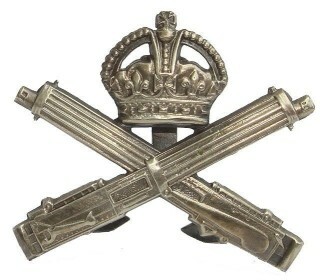 Private 136030, 23rd Depot Coy, 4th Batt. M.G.C. Charles Cecil Oliver was one of two brothers who joined the army during WW1 and were recorded on the Muston Absentee Voters list. He was born in 1898 in Barkestone le Vale, Leicestershire. His father, John Oliver, was born in 1847 in Muston: his mother, Mary (nee Bond), in 1857 in Great Gonerby. They were married in 1876, in the Grantham area. Private Charles Cecil Oliver was entered on the Absent Voter’s List for Muston as: Private 136030, 23rd Depot Coy, 4th Batt. M.G.C; his home address was “Green’s Lane”. This information is upheld by his Medal Index Card. Military records show that Charles Cecil Oliver used the name Charles C Oliver when he was in the Machine Gun Corps. His MIC records the award of the British War Medal and the Victory Medal. Bearing in mind his age, it is probable that he joined when aged 18 in 1916 and joined his unit in the field in 1917. The Machine Gun Corps trained at Belton Park Camp, near Grantham. Theirs was a dangerous role, being a key target for German gunners and snipers. “A total of 170,500 officers and men served in the MGC, of which 62,049 were killed, wounded or missing” (from The Long Long Trail website). The policy was for each brigade to have an MGC Company attached to it. With regard to the 23rd, the Wartime Memories Project has published the following short resume online: The 23rd Company MGC was formed from the MG Sections of 23rd Brigade, 8th Division on the 15th January 1915. They were in action at the Battle of the Somme. In 1917 they fought in the German retreat to the Hindenburg Line and the moved to Flanders and were in action in the Battle of Pilkem and the Battle of Langermarck. On the 20th January 1918 they joined with the other Machine Gun Companies of the Division to form the 8th Machine Gun Battalion. In 1921, Charles Cecil Oliver married Ida C Robinson in the Grantham area, probably in Muston. He had returned to Green’s Lane. In the electoral roll he was registered living next door to his brother John Oliver and Mary Maria Oliver (either their mother or John’s wife). Ida was presumable also there, though she would have not been eligible to vote at that time. He may well have gone back to agricultural work. Later electoral rolls show that Charles (and Ida) lived in the nearby village of Foston, Lincolnshire. In the 1939 register, he was recorded as a “sanitary labourer” living with his wife Ida (b.1899) at “5 Mussons Road, Melton & Belvoir RDC” (it is unclear where precisely this address refers to). Cecil Charles Oliver was buried at Harby on the 19th January 1965, aged 65. Originally named Cecil Charles, adopted the reverse order of his christian names when he enlisted.